Like a relentless housefly on a hot summer day, he’s the pesky accuser, forever seeking to edge his way between my head and my heart. He holds court, as if the “Truth, whole Truth, and nothing but the Truth” would entertain his arguments. Satan. Father of lies, counselor of confusion. I suspect I’m not the only one who sometimes lacks a pest-deterring screen door on the foyer of her mind. The sandal-wearing, dusty-footed flesh of God steps right through the pages of Matthew, looks me square in the spirit, pats the ground beside Him, and draws me into the scene. Sitting among the ancients, the first-called, the disciples whose names I’ve recited since the days of ponytails and popsicles, I listen as if to hear my newborn’s first cry, or my teen’s tires hit the moonlit drive at curfew. Taking a heavenly flyswatter to the accuser, His words bring clarity, affirmation, purpose. With soft, careful strokes, my mind’s eye sketches Him warmly huddling the disciples around his weary human body, dust kicking up in the air as they settle. Sitting cross-legged, shade trees stretched green above, He leans in, urging them to glean by the armloads these private treasures He’s imparted. Oh, the timeless beauty of the Living Word. A mandate from antiquity catching us up in its tide as our generation carries the whispers of a Savior on to the next. Still huddling us close, Defender-of-our-souls’ gaze catching ours, He speaks into our lives in personal ways—advancing His Word from the gables of our times. Satan wants nothing more than to strip our confidence in the ability to recognize the tone of the Divine Whisper. If he can get us to believe the paralyzing “You have nothing to offer” lie, he renders a jury of onlookers deaf to our testimonies, removing our witness from the stands, leaving weakness and inadequacy to falsely testify in our stead. Oh, but, take heart! The pesky accuser has been overruled by one confounding, yet crucial, fact—our presumed lack is the very thing that enables us, for God’s power is made perfect in our weakness. Whatever He has uniquely whispered into your spirit—don’t be afraid to stand in that calling. Boldly speak His heart from the risers of your life. Satan has no authority in the courthouse of your calling. Your qualification is not based on worldly measures, but is solely based on the One who took you aside, graced your cheek with the warmth of His breath, and invited you into the adventure with Him. This is all too true. There have been countless times where I have believed Satan’s lies as truth. Praise God Christ has conquered all. Blessed to be your neighbor from #IntentionalTuesday. Amen, girl! Preach it! The enemy of our souls prowls around like the evil one he is. We have that authority in Jesus to send him packing. So good to start the day with this victory song … and good to meet you, too! “Satan has no authority in the courthouse of your calling. Your qualification is not based on worldly measures, but is solely based on the One who took you aside, graced your cheek with the warmth of His breath, and invited you into the adventure with Him.” Thank goodness! And thank you for sharing! Beautiful imagery filled with so much truth! It doesn’t matter what the enemy calls us . . . Jesus called us to Himself to love and serve. There is NO better place to be. Blessings to you my friend! Thank you Brenda for the visit to my blog! I am so glad to meet you via Intentional Tuesday! You are a very talented writer! I felt like I was transported back to Bible times with Jesus and the Twelve reading your post! Satan does His best cause doubt and deception. I wrote about this in a post last month about the Armor of God. I am leaning to gird myself every day with God’s word to help me handle the persistent and sometime persuasive lies of Satan. Thank you again for sharing your talents. May God richly bless you in all your endeavors! I can so identify with being tormented with the lies of that “pesky accuser” and “counselor of confusion.” I love how you paint the picture of Jesus authoritatively dismantling Satan’s case. Thank you for encouraging me today, Brenda. I’m so glad I am your neighbor at #TellHisStory. So thankful for the Word of God that gives us the right answer to this question every time! Finding your blog today for the very first time. What a blessing! “Taking a heavenly flyswatter to the accuser, His words bring clarity, affirmation, purpose.” Love this line. Such a challenge to keep ourselves oriented to God’s truth rather than the prevalent taunts of the Evil one! Wow…you know when you’re cruising the blog party scene and you just read through a bunch of blogs, kind of out of obligation, because they’re next to yours? Or you don’t wanna be rude and just post and run? Well, how did I stumble on yours? 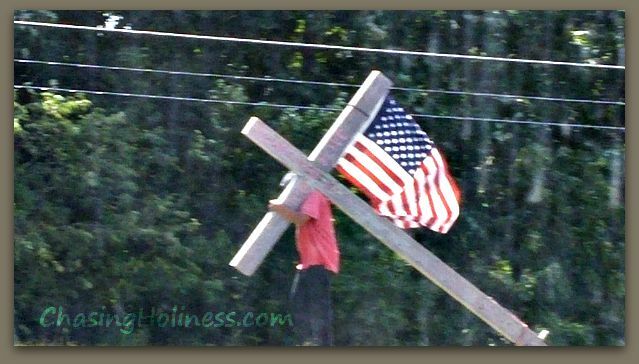 I saw the cross and the flag-two things that really speak to my heart…but I never expected this! Brenda, you spoke directly into my heart with this post. This “pest-deterring screen door on the foyer of your mind?” Oh my gosh, that’s so good, I wrote it on a post it, as a question (Do you have a…). I’ve been struggling lately with “just” writing my blog. I have a book proposal with three chapters written, and it sort of got shot down at a conference, so I put it away. I have another book that I’m trying to get published, but it’s short and an allegory, which is hard to market (so I’ve been told by “the powers that be”–little ‘p’–for publishers). I look at all these polished and published people–and say, “What can I possibly say that hasn’t already been said? They’ve got an angle. They’ve got a twist. Isn’t that clever? Why didn’t I think of that? Look at her beautiful website. You have to speak and write and I have no time to do that.” etc.etc.—no screen door. And then I read this: Whatever He has uniquely whispered into your spirit—don’t be afraid to stand in that calling. Boldly speak His heart from the risers of your life. I need to stop looking at everyone else, and just look to Him. Sit beside Him and let Him direct my life. Thank you so much for this wonderful and timely post! You write beautifully! Hi Brenda, I am glad I stopped over to read this here. When we take our eyes of God we make loads of mistakes. I don’t want to give in to what the enemy is saying. I don’t want to travel in the devils road map. I want God to lead every step of the way. Many times I say to myself, If God is not in it, I rather sit still and wait! Brenda, what an encouraging word … “our presumed lack is the very thing that enables us.” I pray I boldly proclaim His whispers and bring glory to His name, the Name that is above all others. I’m so glad to find your blog again. I remember your last post about the altar of the moment. I really enjoy your vibrant use of language. Oh, but it is the encouragement of your content that cheers my heart on. Thanks so much for this gem! Amen! What a powerful truth! Oh how I need to slam the screen door in my mind shut to keep the pesky enemy out!! His whole purpose is to get us to question Who we are and Whose we are. By doing so, he renders us useless to building God’s kingdom. Thanks so much for the reminder to kick the enemy to the curb and take up our place as children of the King. Great post! I thoroughly enjoyed this! You have such a unique writing style. I have listened to the enemy whisper untruths in my ear for too long. I am thankful that God has called me, and because I am called, He will equip me. Thank you so much for sharing at Weekend Whispers. What a beautiful post! Your words encouraged my heart today. May God continue to bless your writing. Your writing style is like a breath of fresh air. We really are called, aren’t we? What an important and perfect 2 word sentence to tape to our mirrors: “You’re called.” I let Satan take over my mind far too often. Thank you for this beautiful reminder of who is actually worthy of listening to. Many blessings to you, Brenda! Ministry, ministry, and more ministry to the depths of my heart here, Brenda. I always love visiting because your words flow in such a melodious way. But today the words strike deep. They spawn a song of encouragement for a task God has set before me. “Who are you? !” has come to mind and I find myself somewhat stuck like a deer in the headlights. Your words…they cheerlead and chime, “You CAN do this.” Your words are God’s melody to me today. Thank you. Praise God. Kristi Woods recently posted…But What If I Know What’s Best for their Life, Lord? Brenda, I wish I could quote every line in this post that I needed to read today! Your write beautifully. I did not skim. Your words have placed salve on a tender place in my heart. Thank you Nurse Brenda. You assisted the Great Physician well today. Oh, my Brenda! This was just pure, beautiful truth here today! Your words carried me, I felt the dust on my feet as I sat next to Jesus, listening to His every word. What wonderful encouragement here! Wonderful post Brenda! I have been struggling with confidently walking in my calling lately. This post has encouraged me and lifted my spirits. Thanks! Visiting from Open-Mic Monday. Perfect timing to read this post as life has gotten a bit crazier and the enemy is clearing using it to distract me from things I know God has put on my heart. Great reminder that we are called! Blessings!